Waukegan National Airport is a full service public airport offering the best in convenience, customer care and value located just 35 miles north of Chicago. Waukegan National Airport is a general aviation facility categorized by the FAA as a “Reliever Airport” for Chicago’s O’Hare International. 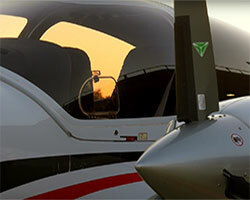 In this role Waukagen National Airport prides itself in the efficient handling of private, corporate, business, executive and governmental aircraft that choose to operate in Northeast Illinois and Southeast Wisconsin. The airport is owned by the Waukegan Port District and professionally managed by F3 Aviation, a national leader in responsible property management. Operating since 1956, Waukegan National Airport has been known as the home of unsurpassed customer service provided by an experienced, friendly and dedicated staff of year round professionals. 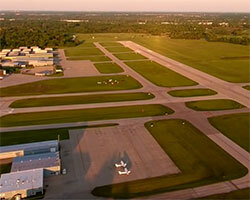 Waukegan Airport consists of two runways. The NE-SW runway is 6,000 feet long and 150 feet wide, while the NW-SE runway is 3,750 feet long and 75 feet wide. Some of the more outstanding features include an Instrument Landing System, Manned Air Traffic Control Tower and even a US Customs office which provides clearances for direct international arrivals. Waukegan National Airport has reached prominence as a base of operations for “Chicagoland’s Fortune 500 Flyers.” There is also infrastructure in place to accommodate large corporate jet hangar sites through land lease or second party build-to-suit arrangements. Additional mid-size hangar development is currently on the drawing board. Waukegan National Aiport’s centralized location between Chicago and Milwaukee lends expediency to the business traveler as the North Shore’s Corporate Aviation Headquarters, the Airport is also in close proximity to large retailers such as Gurnee Mills and Pleasant Prairie Premium Outlets, as well as family entertainment at the Waukegan Marina on Lake Michigan, Six Flags Great America, and Key Lime Cove Indoor Water Park. Due to a well-trained maintenance staff, quality snow removal equipment, along with the Instrument Landing System, the main runway at the airport is seldom closed. The comment has often been made that if one can’t get into Waukegan National Airport then you can’t get in anywhere in northeast Illinois. Please contact the Waukegan National Airport office at 847-244-0055 for further information.